Bronze medalist in 2012 Games was seeded third in Rio. RIO DE JANEIRO – Oak Harbor judoka Marti Malloy, a favorite to medal in the 57 kg division at the Olympics, was eliminated in the round of 16 early Monday. Malloy lost to No. 13 Lien Chen-Ling of Taiwan by penalty in her opening match. “I felt like the fight started out really well,” Malloy, 30, said. “I was getting good grips and a few more attacks off of her. Malloy was the second American woman to medal at the Olympics when she won bronze at the 2012 London Games. She is the reigning Pan American champion and was seeded third heading into Rio. 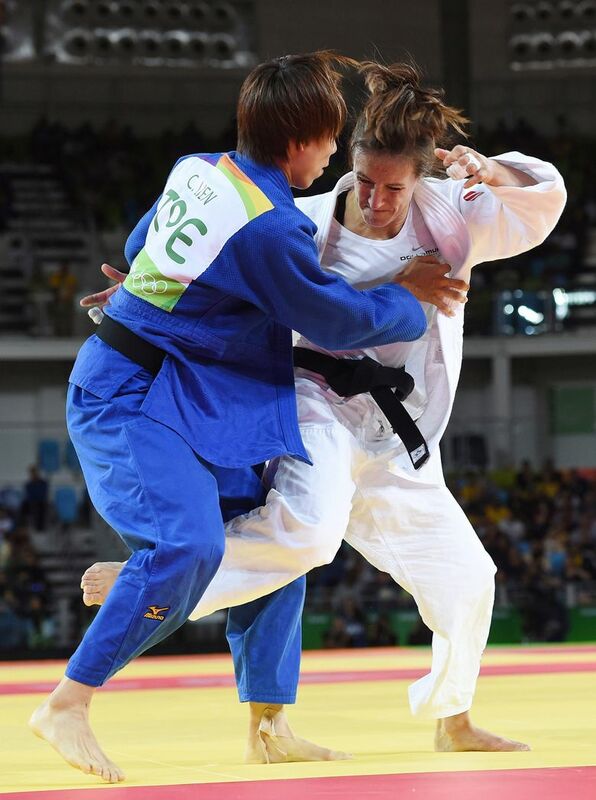 Rafaela Silva won the gold medal, the first of the Rio Games for host Brazil. Overwhelmed with emotion, she performed the Brazilian version of the Green Bay Packers’ “Lambeau Leap” to celebrate. A dozen former Washington rowers competed Monday, a day after high winds postponed the entire program of races. The U.S. women’s eights and quad sculls both qualified to race for medals the next time out. The U.S. women, winners of the last two gold medals in the eights, won a four-boat heat to advance directly to Saturday’s final. Former Huskies Kerry Simmonds and coxswain Katelin Snyder helped the Americans succeed. Former UW rowers Megan Kalmoe and Adrienne Martelli will be in the quad-sculls final Wednesday. This one will surely be seen as a victory for clean athletes over the dopers. No doubt, that was Lilly King’s take. The feisty American stared down Yulia Efimova, a swimmer at the center of Russia’s doping scandal, and then beat her in the pool. King could hardly contain her satisfaction at capturing gold in the 100-meter breaststroke — especially given who was in the next lane. “It just proves you can compete clean and still come out on top with all the hard work you put in behind the scenes, behind the meet, at practice and weight sessions,” the 19-year-old Indiana University student said giddily. King led all the way to take the gold in 1 minute, 4.93 seconds. American Ryan Murphy won the 100 backstroke in 51.97. Michael Phelps, a winner of 19 gold medals, earned the No. 2 seed for Tuesday’s final in the 200 butterfly. Missy Franklin finally got in the pool. only to endure another disappointment in the most unsettling year of her career. The usually bubbly American, who earned five medals at the 2012 Games, failed to make the 200 free final. • Fencer Ibtihaj Muhammad became the first American to compete in the Olympics wearing a hijab. In the women’s sabre tournament, Muhammad, sporting a plain black Muslim head scarf under a red, white and blue mask, was a winner in her opening bout before bowing out. The New Jersey native started fencing in part because the uniform allowed her to adhere to the tenets of her faith. • The U.S. men’s gymnastics team finished fifth, matching its performance from the 2012 Games. Japan won the gold medal, Russia got the silver and China won bronze. • In shooting, Olympia native Dan Lowe was 34th in qualifying in the 10-meter air rifle competition and did not advance. • Australia beat New Zealand 24-17 in the women’s rugby sevens final. - Information compiled from wire reports.